The Uganda Police Force has released the 2017 annual crime and traffic report, indicating a 3.3 percent increase in cases registered compared to the previous year. 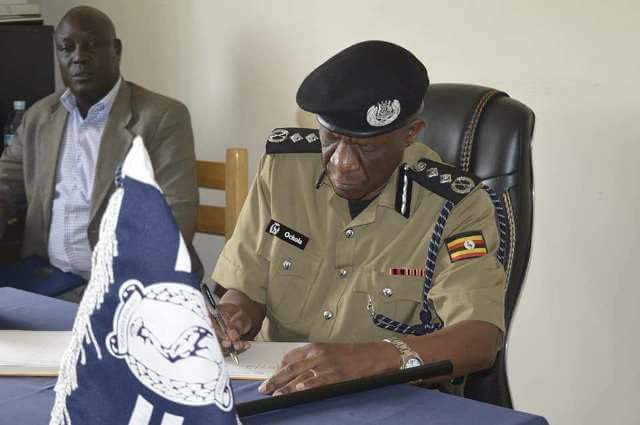 The report launched by the Inspector General of Police Martin Okoth Ochola at Naguru Police Headquarters indicates that 252,065 cases were registered in the year 2017, compared to 243,988 cases in the year 2016. The statistics also indicate an upward trend in crime contrary to the trend in the previous three years. From the year 2014-2016, the crime trend was going down. In terms of districts, Lira topped the list followed by Ntungamo and Mbarara. The crime report covered the period January 1- December 31, 2017 in which the country witnessed the killing of ppPolice Spokesperson Andrew Felix Kaweesi and killings of about 23 women in Nansana and Entebbe. The report however shows a decline in cases of murder by shooting from 171 in 2016 to 167 in 2017. However, the report shows a general rise in homicide cases from 4,315 in 2016 to 4,473 cases in 2017. While presenting the annual report, the Director CID Grace Akullo decried the law funding to her directorate, which she says had hampered management of crime. “We need to build capacities of detectives in areas like cybercrime,” she said. Despite the inadequacies however, Akullo reported a breakthrough in arresting of perpetrators of the women murders. She reported that 18 suspects were produced in court, while 14 of them were committed to High Court in Entebbe. In Nansana, 13 suspects were arrested while one of them was properly identified through DNA. Launching the report, IGP Ochola blamed the rising crime levels on increased economic activity. “There is a lot of economic activity, thus increase in crime,” he said. On law funding, the IGP promised to lobby for more funding to facilitate the police, especially key directorates like CID.